Oganesson atoms have 118 electrons and the shell structure is 2.8.18.32.32.18.8. The ground state electronic configuration of neutral oganesson is [Rn].5f14.6d10.7s2.7p6 (a guess based upon that of radon) and the term symbol of oganesson is 1S0 (a guess based upon guessed electronic structure). Oganesson: description Your user agent does not support the HTML5 Audio element. On 8 June 2016 IUPAC announced the new name oganesson (symbol Og) for element 118 in place of the temporary systematic name oganesson (Uuo). A five-month review period expires 8 November 2016 to review this name prior to formal approval by IUPAC. The solid state structure of oganesson is: bcc (body-centred cubic). Reactions of oganesson as the element with air, water, halogens, acids, and bases where known. Binary compounds with halogens (known as halides), oxygen (known as oxides), hydrogen (known as hydrides), and other compounds of oganesson where known. Bond strengths; lattice energies of oganesson halides, hydrides, oxides (where known); and reduction potentials where known. Oganesson was discovered by (not yet confirmed) in 2002 at (not yet confirmed). Origin of name: for the element with atomic number 118 the collaborating teams of discoverers at the Joint Institute for Nuclear Research, Dubna (Russia) and Lawrence Livermore National Laboratory (USA) proposed the name oganesson and symbol Og. The proposal is in line with the tradition of honouring a scientist and recognises Professor Yuri Oganessian (born 1933) for his pioneering contributions to transactinoid elements research. His many achievements include the discovery of superheavy elements and significant advances in the nuclear physics of superheavy nuclei including experimental evidence for the "island of stability". [Source IUPAC statement.]. 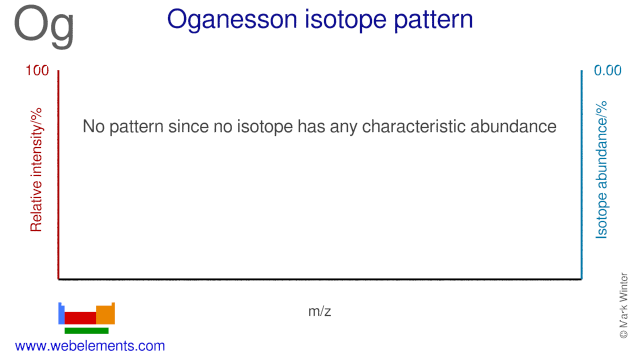 Isotope abundances of oganesson with the most intense signal set to 100%. Isolation: experiments conducted at Dubna in Russia at the Flerov Laboratory of Nuclear Reactions (by workers from the Joint Institute for Nuclear Research in Russia and the Lawrence Livermore National Laboratory in the USA) indicate that element 118 (oganesson, Og) was produced. Not too much though, one atom in the spring of 2002 and two more in 2005. The 2002 experiment involved firing a beam of 4820Ca at 24998Cf. The experiment took 4 months and involved a beam of 2.5 x 1019 calcium ions to produce the single event believed to be the synthesis of element 118 (ununoctium) as the 294118Uuo isotope. Three neutrons are released during this process. The 282112Cn species then undergoes spontaneous fission (denoted SF) to other species. An important part of this work was additional work synthesising isotopes of element 116 through irradiation of 245Cm (as opposed to 249Cm referred to above). Analysis of this reaction very clearly indicates that 290116Lv is indeed a decomposition product of 294118Uuo. This research was reported at an IUPAC conference in China (Yu. Ts. 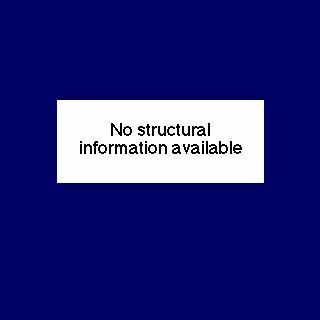 Oganessian, "Synthesis and decay properties of superheavy elements", Pure Appl. Chem., 2006, 78, 889-904.) in August 2006 and then more recently in Phys Rev C [Yu. Ts. Oganessian, V. K. Utyonkov, Yu. V. Lobanov, F. Sh. Abdullin, A. N. Polyakov, R. N. Sagaidak, I. V. Shirokovsky, Yu. S. Tsyganov, A. A. Voinov, G. G. Gulbekian, S. L. Bogomolov, B. N. Gikal, A. N. Mezentsev, S. Iliev, V. G. Subbotin, A. M. Sukhov, K. Subotic, V. I. Zagrebaev, G. K. Vostokin, M. G. Itkis, K. J. Moody, J. B. Patin, D. A. Shaughnessy, M. A. Stoyer, N. J. Stoyer, P. A. Wilk, J. M. Kenneally, J. H. Landrum, J. F. Wild, and R. W. Lougheed, "Synthesis of the isotopes of elements 118 and 116 in the 249Cf and 245Cm+48Ca fusion reactions", Phys. Rev. C, 2006, 74, 044602]. Earlier, a team of Berkeley Lab scientists announced in 1999 the observation of what appeared to be element 118 but retracted the claim after several confirmation experiments failed to reproduce the results. This means that the following apparently is wrong. Please see this page for more details. In this work it was claimed that elements 118 and 116 were formed by accelerating a beam of krypton-86 (8636Kr) ions to an energy of 449 million electron volts and directing the beam onto targets of lead-208 (20882Pb). After 11 days work, just three atoms of the new element were identified. The production rates for element 118 are approximately one in every 1012 interactions. The element 118 nucleus was said to decay less than a millisecond after its formation by emitting an α-particle resulting in an isotope of element 116 (mass number 289, containing 116 protons and 173 neutrons). This isotope of element 116 undergoes further α-decay processes to an isotope of element 114 and so on down to at least element 106 (seaborgium).